We are so excited to spend time on Daybreak with Jerome and Karen Fisher!!! Out to The South Pacific we go…. Thunderball Grotto an unforgettable marine cave. The cave has three entrances, all just barely lapped by water. At low tide we dove just two feet under jagged limestone to the hidden central caverns below. As we entered the cave a multitude of colorful fish swarmed around us and our baggie of fish food. The coral and sponges along the exterior walls with shimmering shafts of sunlight pouring through holes in the ceiling illuminated the clear warm water below, was an amazing experience. Several movies such as 007’s Thunderball and Never Say Never Again, and the mermaid tale Splash where all filmed at this site. We have enjoyed our stay at Staniel Cay, anchored up in Big Major, with the swimming pigs, snorkeling in the clear blue water of Thunderball Grotto, playing pool at the yacht club, exploring the island, visiting with other boaters and enjoying our concert/ movies on the bow of Anna Mae, makes for wonderful memories. October 14th we untied and pulled out of The Jarrett Bay Boat Yard after several weeks delay, all onboard Anna Mae breathed a heavy sigh of relief. At last on our way south to Charleston South Carolina. Bill reconnected the tie rod end to the cylinder and used some lock tight to ensure it would not loosen again. He changed out the valving on the starboard side fin but the symptoms did not change which ruled out this was the source of the problem. We managed to get a couple of Trac Stabilizer Specialists onboard. The specialists looked into the main computer. After taking off the cover plate the symptoms came and went with torque being applied to the housing. They determined there was an abnormality in the brain of the main computer and took the coding from our main computer, recoded a new computer to match and sent it to us. Bill installed the new computer and control pad. Anna Mae has been motoring smoothly ever since. Within the next year we plan to replace the hydraulic cylinders on the fins and re-bush the hydraulic cylinder pivot points. The Charleston City Marina was our home for a couple of weeks. We managed to visit and catch up with fellow Nordhavn owners, tour plantations, eat wonderful food, shopped the various boutiques and markets, enjoying every minute. Happy to report our travels further south where uneventful, except for the marlin we brought aboard. Currently we are anchored at Meeks point, a mile off Spanish Wells Harbor. The water is very shallow, allowing us to enter only at high tide. Happy to report clearing Customs was uneventful. 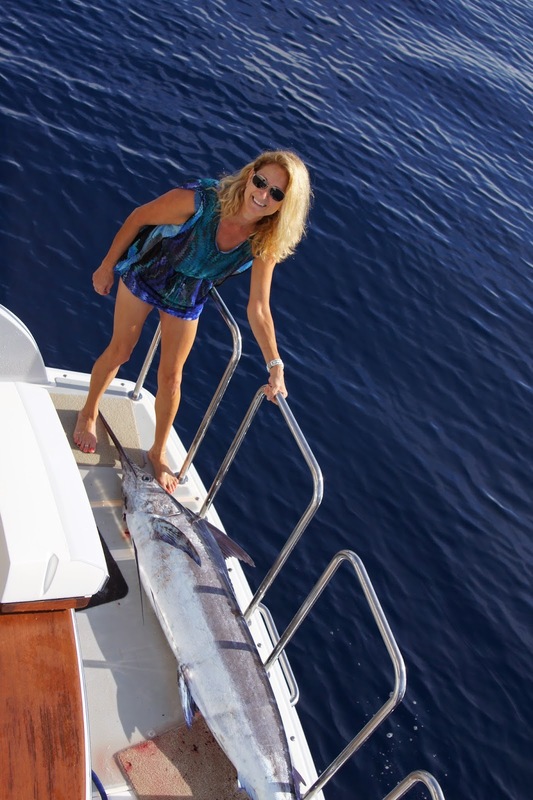 The water is beautiful, the fish are plentiful and life is good aboard Anna Mae.